Grow stunning daylilies with these tips for success. Daylilies are some of the most forgiving perennials around. As long as they have enough sun and water, they’ll perform well. But if truly stunning daylilies are your goal, here are a few easy tips that will ensure your plants live up to their full potential. Daylilies tend to be pretty laid-back about nutrition. They don’t need much fertilizing. Just a single application once the plant is established, and then another each spring are usually enough. 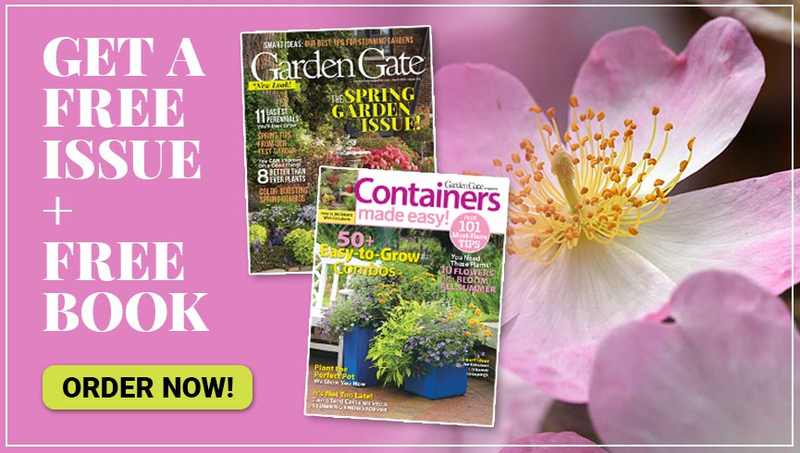 Look for a good rose fertilizer — daylilies and roses like the same conditions. If you live in an area with sandy soil, where nutrients tend to leach out, you may need to fertilize more often. But avoid overfertilizing, or you’ll end up with lush foliage and few blooms. More important to daylilies than fertilizer is water. Daylilies need generous watering, especially during bloom season. More water equals more prolific and bigger blooms, so set a watering schedule and stick to it. Keeping daylilies well-watered will also help reblooming cultivars to put on a longer show. For the best performance, plant your daylilies in the spring or early fall. This gives them enough time to establish roots before the summer heat or winter cold kicks in. They can survive a summer planting, but be sure to give them plenty of water. When you’re ready to plant, choose a spot that gets at least 6 hours of sun each day. Some daylilies will bloom in part shade, but they can get leggy and weak. These perennials need rich, well-drained soil to do well. If your soil is poor, no problem. You can easily amend it. When you dig a planting hole for your daylily, set aside all of the soil you pull out. Then mix it with generous amounts of compost until you have about half compost and half soil. If you have clay soil, you may want to add two or three handfuls of coarse sand to really improve drainage. If you plant container-grown daylilies, add 2 in. of the amended soil to the bottom of the planting hole. Then, before you put your daylily in the ground, check out the plant’s roots. The roots of container-grown daylilies can get pretty tangled. So tease them apart, or, if they’re really tight, make a few shallow vertical slices through the root ball to break them up. If you plant bare-root daylilies, dig a hole at least a foot deep and wide enough so you can spread out the plant’s roots. Then build up a mound of dirt in the middle of the hole (use amended soil, if needed). This will help you spread out the daylily’s roots. Set the plant on top of the mound of soil, fanning the roots down the sides. Make sure that the plant’s crown is no more than an inch below the soil’s surface. Then fill in the hole around the roots, firm the soil and water well. 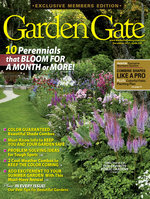 Learn more about how to prepare and plant bare-root perennials here. When it comes to spacing, daylilies need room to breathe. 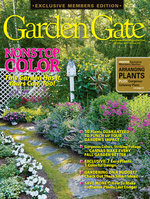 In general, small-flowered and miniature cultivars need to be placed 16 to 24 in. apart. Plant large-blooming daylilies 18 to 30 in. apart. But for a fuller effect (in a border, for example), space plants 12 to 18 in. apart, and divide plants more frequently. The flowers only last for a day, so keep the plant looking tidy by removing the spent blooms. 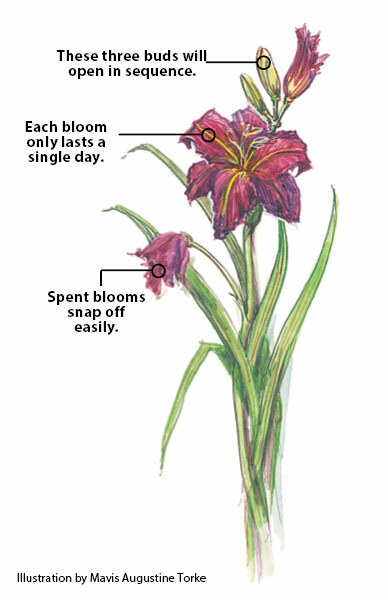 This illustration shows how a flower stalk, or scape, may have buds, a blooming flower and a spent flower all at the same time. Daylilies rarely give in to pests, but watch for aphids, thrips and spider mites. If you see them, treat with insecticidal soap or a shot of water from the hose. Daylily rust is caused by the fungus Puccinia hemerocallidis. The main symptom of infection is raised orange or yellow spots (pustules) on the leaves, especially the undersides. Resistant daylily cultivars may only show a few spots, while other daylilies will eventually turn yellow and die back. Daylily rust is an airborne disease, so it’s difficult to prevent. However, there are a few things you can do once you see symptoms: Control rust during the growing season by applying a fungicide, according to package instructions. Then clean up and burn or throw away (don’t compost!) diseased foliage in the fall. Poor drainage and circulation contribute to crown rot. If a healthy plant suddenly turns yellow, withers and drops its buds, it may have rot. Lift it from the soil and check the roots for soft, mushy areas. If the soft area has a foul odor, it’s probably a bacterial problem; if it has an earthy, compost-like odor, it’s probably a fungal problem. Cut off the diseased area and treat the plant’s roots with either a bactericide or a fungicide. Then it’s ready to go back in the ground. Divide your daylilies when they stop blooming vigorously, or when you want to share them. Divide in spring or fall by digging up the plant’s entire clump of roots. 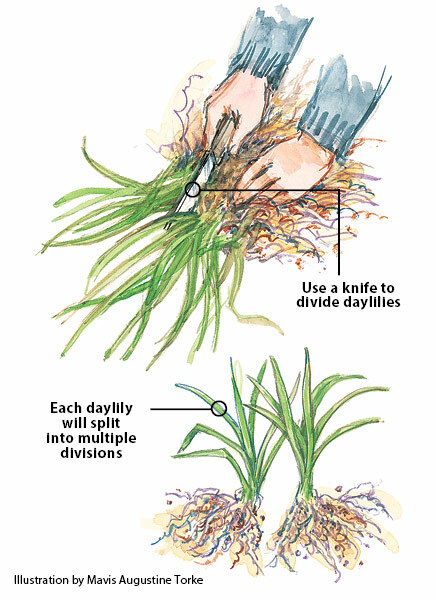 Shake off extra soil, and with a sharp knife, cut or pull the clump apart into divisions. 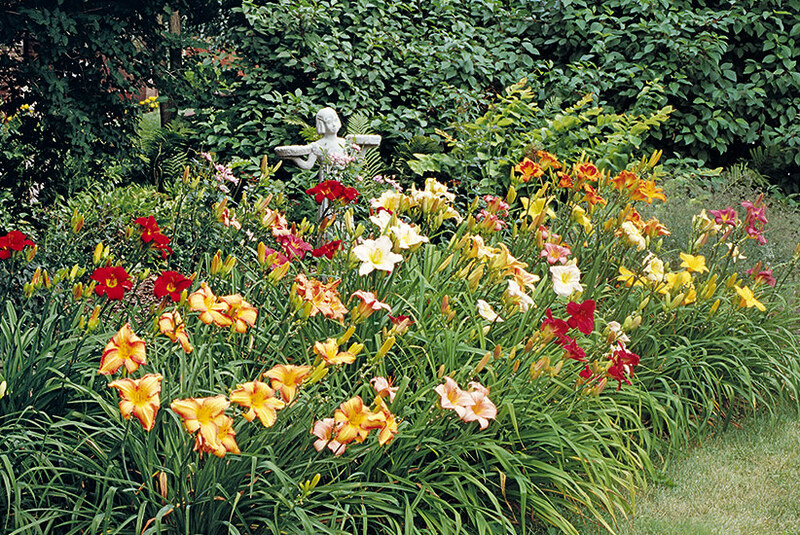 Each division should have at least three “fans,” although daylilies can grow back from as little as one fan. Next, mix generous amounts of compost into the soil, then replant and water well.